Potamogeton interruptus Kitaibel in Schultes, OEst. Fl. Ed. 2, 328. 1814. Potamogeton flabellatus Bab. Man. Bot. Ed. 3, 343. 1851. Stems arising from a running rootstock which often springs from a small tuber, 2°-4° long, branched, the branches spreading like a fan. Leaves linear, obtuse or acute, 3'-5' long, 1"-1 1/4" wide, 3-5-nerved with many transverse veins; narrow, 1-nerved leaves on some plants, these acuminate, as P. pectinatus; stipules partially adnate to the leaf-blade, the adnate part 1/2'-1' long, sometimes with narrowly scarious margins, the free part shorter, scarious, obtuse; peduncles 1'-2' long; spikes interrupted; fruit broadly and obliquely obovoid, obtuse at the base, the largest 2" long and nearly as broad, keeled and with rounded lateral ridges on the back, the face nearly straight; style facial, erect. In ponds and streams, Michigan, Nebraska, Saskatchewan and Wisconsin. Also in Europe. August. 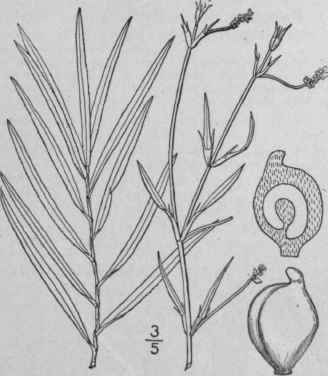 Potamogeton Robbinsii Oakes, Hovey's Mag. 7: 180. 1841. Stems stout, wide-branching, 2°-4° long, from running rootstocks. Leaves linear, 3'-5' long, 2"-3" wide, acute, many-nerved, crowded in 2 ranks, minutely serrulate, auriculate at attachment with the stipule; stipules with the adnate portion and sheathing base of the leaf about i' long, the free part 1/2'-1' long, acute, persistent, white, membranous, lacerate; peduncles I'-3 long, inflorescence frequently much branched, with 5-20 peduncles; spikes interrupted, 1/2'-l' long, flowering under water; fruit obovoid, about 2" broad and \\" wide, 3-keeled on the back, middle keel sharp, lateral ones rounded, face arched, sides with a shallow depression running into the face below the arch; style subapical, thick, slightly recurved; apex of the embryo pointing a little inside the basal end. In ponds and lakes, New Brunswick to Oregon, south to New Jersey, Pennsylvania and Michigan. The plant is freely propagated by fragments of the stems which throw out rootlets from each joint, but this is the rarest of our species to form fruit. Aug.-Sept.